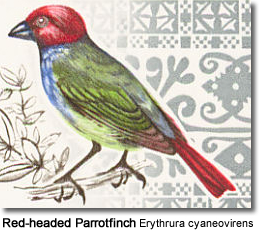 The Red-headed Parrotfinch Erythrura cyaneovirens efatensis, is a common finch found in New Caledonia, Samoan Islands. It also relatively common on Efate, also known as Île Vate - an island in the Republic of Vanuatu (Shefa Province). It inhabits subtropical/ tropical lowland moist forest. The back is green. The head is red.